George V (George Frederick Ernest Albert; 3 June 1865 – 20 January 1936) was King of the United Kingdom and the British Dominions, and Emperor of India, from 1910 through World War I (1914–1918) until his death in 1936. He was the first British monarch of the House of Windsor, which he created from the British branch of the German House of Saxe-Coburg and Gotha. From the age of twelve George served in the Royal Navy, but upon the unexpected death of his elder brother, Prince Albert Victor, Duke of Clarence and Avondale, he became heir to the throne and married his brother’s fiancée, Mary of Teck (known as “May” to her family after her birth month). 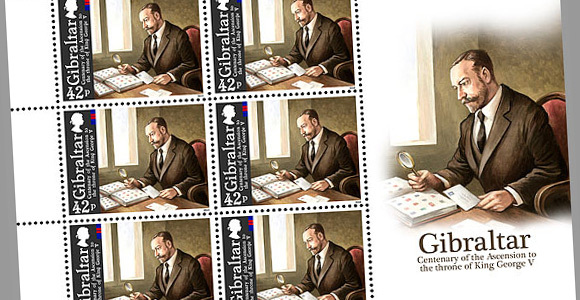 Although they occasionally toured the British Empire, George preferred to stay at home with his stamp collection and lived what later biographers would consider a dull life because of its conventionality. George became King-Emperor in 1910 on the death of his father, King Edward VII. George was the only Emperor of India to be present at his own Delhi Durbar, where he appeared before his Indian subjects crowned with the Imperial Crown of India, created specially for the occasion. During World War I he relinquished all German titles and styles on behalf of his relatives who were British subjects, and changed the name of the royal house from Saxe-Coburg and Gotha to Windsor. During his reign, the Statute of Westminster separated the crown so that George ruled the dominions as separate kingdoms, preparing the way for the future development of the Commonwealth. His reign also witnessed the rise of socialism, communism, fascism, Irish republicanism, and the first Labour ministry, all of which radically changed the political spectrum.